I’m just loving being out in the garden these days. We went to our local garden nursery recently and bought a bunch of annuals for our planters and containers. We also stopped off at the Salvation Army store and I saw a lovely wicker purse, and I knew immediately that I wanted to use it as a planter. The zipper was broken so it only cost me $1. 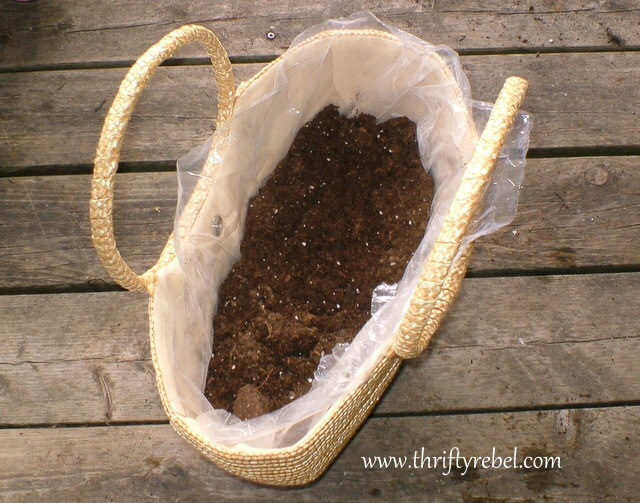 I love using unusual things as planters, and it’s so easy to make a bag of blooms. I found the purse on the left at another thrift store for $2. And even though I loved it I knew I would never use it as an actual purse, so I decided it had to join the planting party. All I needed was a couple of plastic bags and some pea gravel. I used bags that hold the kitty litter in the kitty litter boxes that we buy, and we have a small pile of pea gravel left over from some path projects that we did a few years ago. First I made sure the bags had no holes in them, and then I cut them to size and inserted them into the purses. I poured about 2 inches of pea gravel into the bottoms to give the soil a little bit of drainage and also to add some weight to the purses so they’d sit nicely. Then I added the potting soil. I always use Miracle Gro. 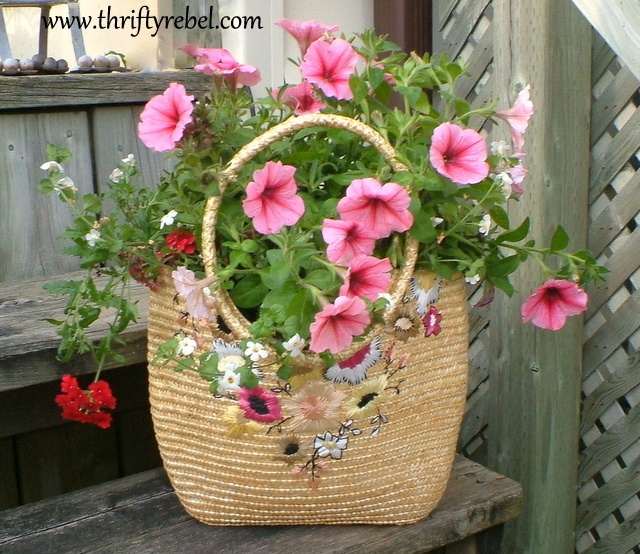 I used a pretty pink petunia hanging planter in this one. I just took the whole plant out of its pot and put it into the bag and filled in any gaps with potting soil. 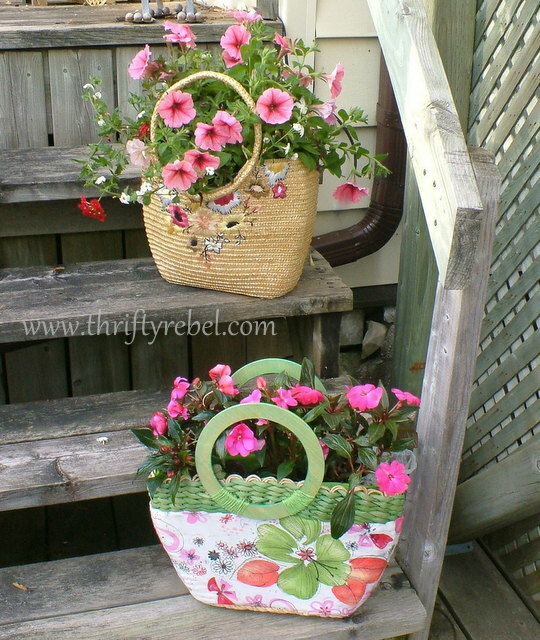 And the hot pink sunny impatiens for this one were in small 4″ pots. 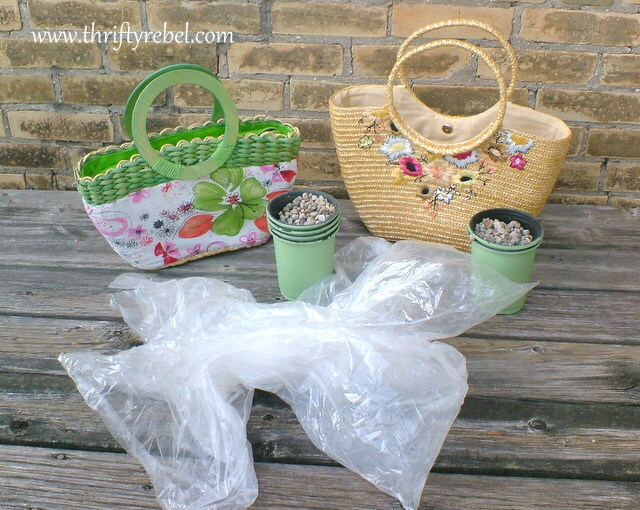 When watering these purses I’ll use a can with a narrow spout so I don’t get water all over the purses, and if I know rain is coming I’ll be putting them under cover. And here they are, sitting on the steps of my back deck. This was such an easy and fun project. Save for later by pinning to your favorite board! 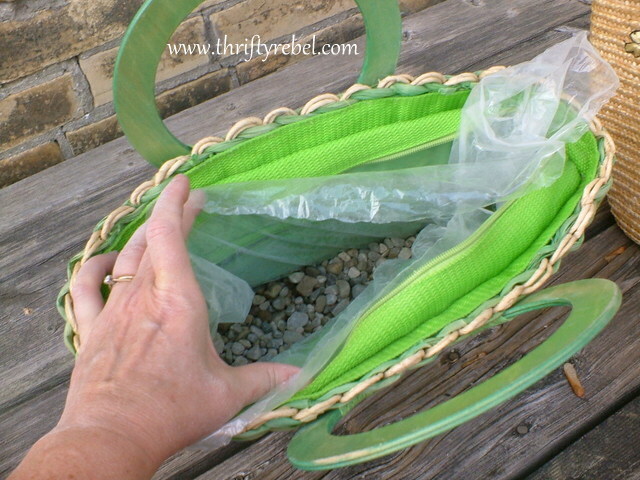 So the next time you see a purse or a tote at a thrift store or garage sale pick it up and give this a try. If you enjoyed this post you’ll love these too! I think they are so pretty and adorable! What a great idea! Those purses are so pretty and your idea of putting flowers in them is Precious. Nice job. I’ll be on the lookout for nice purses at Goodwill. ?????????? Oh Tuula they're so pretty what a gorgeous idea, pinning! These look so beautiful, Tuula. What a great idea! Well how pretty are those?!! What a fun find and a great way to use it! Nice job Tuula! Gorgeous. 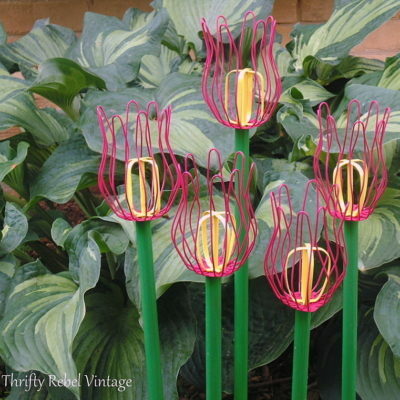 Love that you used something interesting and unexpected to plant them in. They must bring a huge smile to your face every time you go up your stairs. Too cute – definitely pinning these my friend !!! This is beautiful and so clever! I will definitely have to remember this for next year when I plant 🙂 Thanks for sharing. What a cute idea! I love it! They look so pretty sitting on your steps. Pinned it! Thanks so much for sharing (saw it on Show Me What you Got)! What a lovely and sweet idea! What a fun idea! I love it…. :) I never would have thought to do this, but it is so pretty. I'll be keeping my eyes peeled for just the right bag! Now that is adorable. I think those would make adorable gifts. 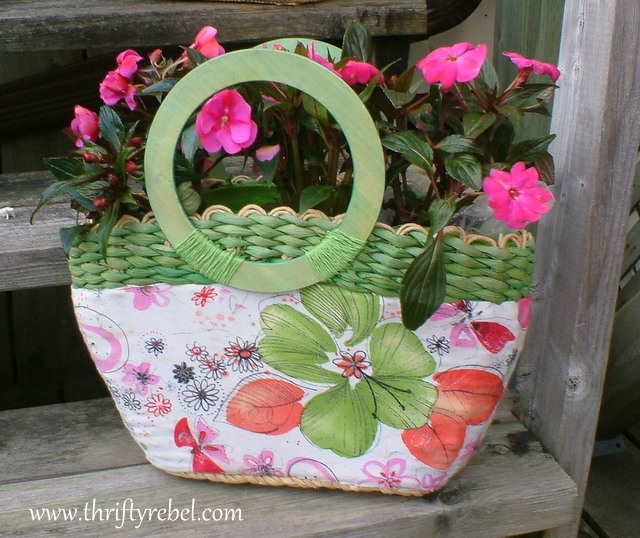 Wow, these are so colorful….I did this years ago with an old wicker purse too. But love your colorful totes even more! Girl!!! I love this idea! YOU are a genius! This looks so pretty. What a wonderful idea! So clever- and a great way to repurpose new life into something so cute but old fashioned. Love it. A perfectly pretty way to place posies in purses. Oh my gosh! This is the cutest idea! I am going to the thrift store tomorrow looking for summer bags! I love this! 🙂 Pinning! 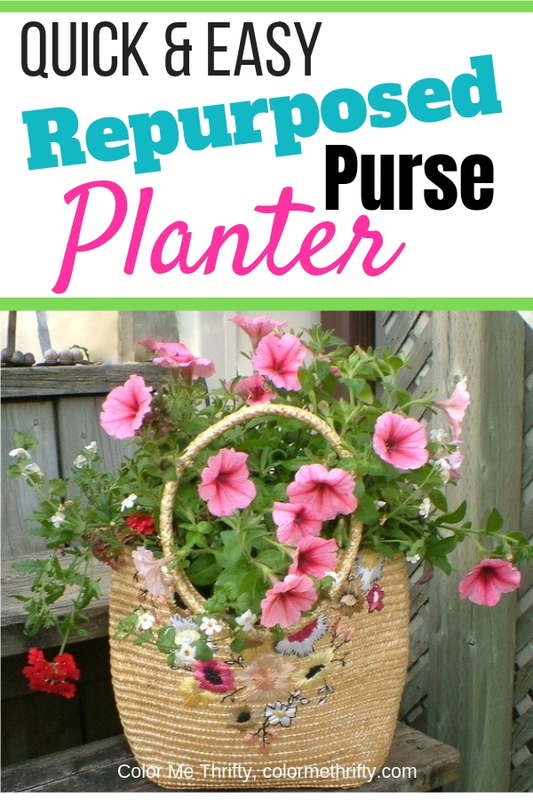 Great Idea using purses for planters, very cute! Thanks for sharing at Simple & Sweet Fridays! How clever! I never would have thought to do this! So cute! Creative and oh so adorable! What a fun and clever idea!. This would be a cute idea for indoor plants as well. Thanks for stopping by and linking up to Fluster Buster's Creative Muster Party! 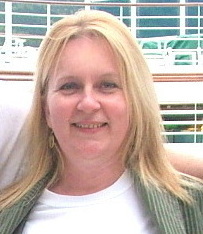 Looking forward to seeing what you're going to link up next week. This is the cutest idea and a great excuse for me to buy those cute summer totes. Love it. Thanks so much for sharing! What a great idea. I have just the basket – red and yellow straw – sitting in the attic. I love it when I can do a project on the cheap. Delightful and something I have seen but never done. Your post is making me rethink and old basket/purse that I was going to Goodwill. They may have to wait until next year. 😀 Thanks for sharing. Super cute! And I'm with you, unique and unusual planters are the best! Such a cool idea! I love the green bag! How lovely is that! Have to have a go at this. Wow, such innovation! from Life on Lakeshore Drive link up. These couldn't be any cuter! Thanks for sharing. These are so so sooooo cute!!!! So cute!! I will feature this tomorrow on Home Sweet Home! Thank you for joining Home Sweet Home! Love your bag of blooms. So cute! What a great idea! I need to look for a thrift shop purse and do this. Thanks for the idea. Yours look great. I love these. You better believe I'll be on the look out at yard sales and thrift stores for purses now. Pinning. Thanks Teri! I hope you find some bags. 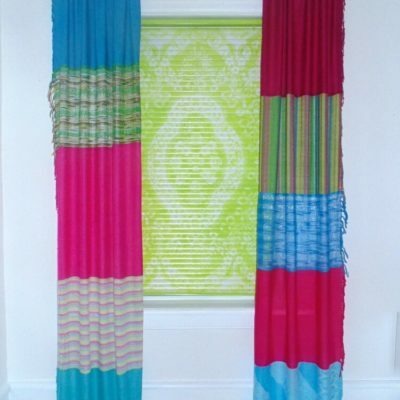 This is a really fun and easy project! Love, love these! Wish it was Spring time instead of Fall, but guess I could do this with Fall mums. Thanks so much Marie! Fall mums would be just beautiful.